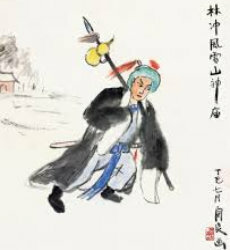 A Midnight Escaping Of Lin Chong (林冲夜奔, Lin Chong Yie Ben, Guzheng,古筝) was adapted by Lu Xiutang(陆修棠) and Wang Xunzhi(王巽之) . This tune has drawn its materials from Kunqu ” Sword • Midnight Escaping” . Enjoy A Midnight Escaping Of Lin Chong (林冲夜奔, Lin Chong Yie Ben, Guzheng,古筝) in your browser now (just click the Play button below). If you browser does not support HTML 5, you may use flash player below. Your browser must support Flash. Listen more Guzheng tunes? Back to Guzheng (古筝) page. Or back to our Chinese Classical Music Media Library main page.